Windows DNLA support, and some thoughts for the future. Microsoft recently announced that a new crop of high-end audio receivers, specifically the Onkyo TX-NR3008 and TX-NR5008 are Windows 7 Certified with DNLA. The Onkyo TX-NR5008 receiver, costing $2700. In the case of the receivers, you can easily play music from your PC to these devices with just the right-click of your mouse. If you haven’t used Play To before, just open Windows Media Player or Windows Explorer. Right click on your audio track and select “Play to.” The Play To session will open and you’ll be enjoying your favorite media on your Onkyo receiver. You can also select the “Play to” button above the now playing list in Windows Media Player. 2. Revisions to the Windows sound model to actually allow for multiple outputs. I suspect this is disabled for reasons relating to DRM, but I picture something like a visual mixer that lets me make many-to-many mappings between audio producing applications and audio output devices, graphically. I’ve made a mock-up of what I think this could look like, showing multiple sources and multiple applications. I picture being able to drag and drop applications between the sections to move them; perhaps right-click and drag to clone an application’s audio output stream so it can be sent to multiple devices. Clicking the “X” button would remove the audio source from that output if the option is available. Just think about it: a Windows 7 PC could become the entire center of a multi-room networked entertainment system. Drag and drop to send audio from your MP3 collection out to the networked receiver in the garage or your kids room…set every stereo in the house to the same music by cloning an output stream multiple times and sending it to every device simultaneously…and the possibilities grow further if it’s expanded to video. 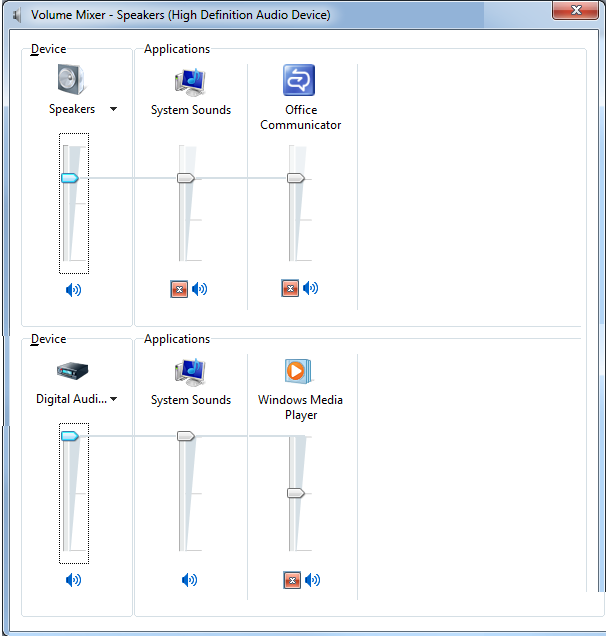 This is what I’d like to see Windows do for audio. As it stands now, I just hook my receiver up to the computer directly because no network audio solution has worked well enough for me. It’s mainly because the network audio applications are too focused on media files and not audio streams. Networks are getting faster and more ubiquitous, it’s time to shift the focus back to the network from the media itself to really enable some innovation. This entry was posted in Commentary, Software, Technology and tagged dnla, microsoft, onkyo, receiver, streaming, ui mockup, windows audio. Bookmark the permalink.